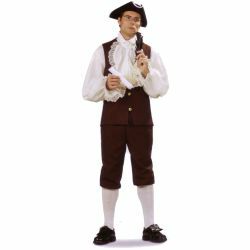 This deluxe quality John Adams costume can be used to create the famous early American Adams. It can also be used as a colonial period costume for men. The costume includes a poly-cotton shirt, jabot with lace trim, a poly-poplin vest, and matching knickers. Don’t forget a Tricorn Hat, Colonial Stockings, and Colonial Shoes to complete the look. Costume is available in brown or blue. Adult size men’s small, medium, large or extra large. Note: These are special order costumes and generally take two to three weeks for delivery. If you need rush delivery please call 1-877-218-1289. Per our return policy Special orders cannot be cancelled, returned, or exchanged.